Deborah Randall's work is part of private and corporate collections as well as Universities and galleries worldwide and she continues to exhibit worldwide today. (Sinclair University, Edinboro University, Portland Museum of Art, The Painting Center in New York City, America Haus in Cologne and Camberwell College of Art in London). Deborah earned a Bachelor of Fine Arts degree from California College of The Arts and a Master of Fine Art degree from Savannah College of Art and Design. Randall started her professional career as an Artist by teaching painting at numerous colleges and universities along the east coast including Colby College, Georgetown University and the University of Maine. Her perspective on light, color and emotion was influenced equally by the energy of 80s-era punk rock shows and outdoor coastal adventures as she grew up in Washington D.C. and northern California. Eventually, Deborah found Maine where she renovated an 1800s farmhouse. 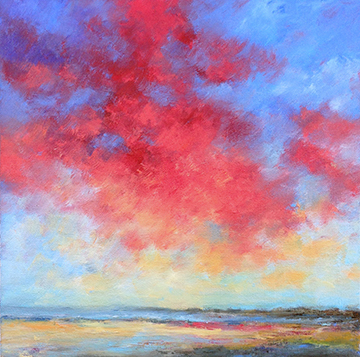 It was in that historic setting that she fell madly in love with the Maine coast and has made it her passionate practice ever since..
"The Maine coast and the tidal marshes nearby inspire the landscapes of my work. I hope to evoke the feeling of being present in the landscape by concentrating on communicating the quality of light and color, the feel of the breeze and vastness of space. I often work from memory and intuition to convey atmospheric perspective and timelessness in nature."